Arive Delhi and transfer to hotel.Overnight at hotel. Morning sightseeing of Delhi visiting Red Fort ,Jama Masjid, Dargah of Hazrat Nizamuddin Auliya,Humayun's Tomb. Also visit India Gate , Qutab Minar. Overnight at hotel. 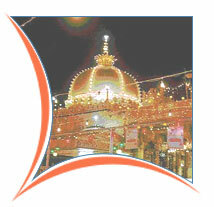 Transfer to railway station to connect train for Ajmer. On arrival transfer to hotel. 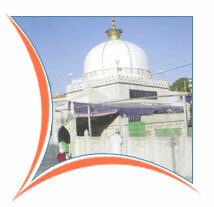 Afternoon tour of Ajmer visiting , Dargah Shareef - the shrine of Khwaja Moinuddin Chisthi. Continue on to Adhey Din - Ka Jhanpara. Proceed to Emperor Akbar's Royal Palace made of red sand stone - housing a museum with a rich collection of Moghul & Rajput armour. After that , drive around Ana Sagar lake. Overnight at hotel. Drive to Jaipur and check in at hotel Ajmer/Jaipur ( 131 kms/03 hrs ) . Tour of Jaipur visiting Maharaja's Palace , Hawa Mahal , Royal Observatory and Albert Museum. Overnight at hotel. Morning excursion of Amber Fort , where ascent to the fort is on elephants. Afternoon at leisure. Drive to Agra via Fatehpur Sikri (Jaipur/Fatehpur Sikri/Agra 221 kms/05 hours) to visit the Mosque built by Emperor Akbar in the memory of Sheikh Salim Chisti. On arrival , check in at hotel. Overnight at hotel. Morning visit Taj Mahal - built by the Moghul Emperor Shah Jehan in memory of his wife Mumtaj Mahal ; Agra Fort on the opposite bank of River Yamuna built by four successive Emperors ; and the tomb of Itmad - Ud - Daullah.Afternoon at leisure. Afternoon drive to Delhi via Sikandra (Agra/Sikandra/Delhi 203 kms/05 hours) Sikandra- Mausoleum of Emperor Akbar. On arrival , check in at hotel. Overnight at hotel. Drive back to Delhi and overnight at hotel.